How do you study for Part 1 MPath Exam? In order to proceed to Part 2 Master of Pathology program, you need to pass part 1 exam first. Failure to do so will cause you to be retained in first year and you will be wasting another year studying the same thing all over again. A lot of senior that I've met before sitting for that exam warned me that Part 1 can be toughed as you need to cover 4 specialties instead of just focusing to one area of your interest. So no matter what you choose during your initial application, you need to study all other subjects too. So, in summary, it's like med school all over again. I've described the structured of the exam in my last post. Here, I just want to tell a story on how can you pass the exam, this is not a guideline, nor something you need to follow, this is just my story. 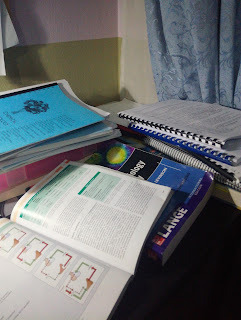 Within that first year of study, you need to cover 4 module: Anatomic Pathology, Hematology, Microbiology, and Chemical pathology, (and a little bit on forensic pathology too). In my observation, there are 2 method to ensure you finish covering all the topics within 1 year time. The first method is the classic method of study group. It was very important to have a study group and I have seen how study group can really improved your understanding on every subject that you need to cover. Another method, is by not studying in groups. This method is suitable for an introvert, like myself. I just can't keep up with group schedule and commitment. This method is flawed because you have to put more effort and more luck to went through the exam. Highly not recommended but it is possible. Towards the end of my first year, I was worried because I do not have study group. Luckily I have a friend who I can whatsapp and discuss without formal meeting when I don't understand something. They help me a lot. I am not afraid to be called and look like a stupid, I just ask if I do not understand. I am not those type who are very vocal, but asking a few of my friend sometimes even at midnight when I could not sleep, and a few other awkward time, and I am so lucky that I have 2-3 friends that are willing to answer my 'stupid' questions. Important, form a study group! I don't have one and I can tell you how hard it is to not have one. What do you study? When you enter this program, everyone will always tell you that you need to answer MCQ. Do MCQ. Practice MCQ. What is the matter with this trend of doing MCQ anyway? Some people even tell that by doing only MCQ, they can pass the exam without problem. I doubt that. First, before the MCQ, read the books! There will be only 4 books that you need to read cover to cover within 1 year time. Robin's Pathology, Hoffbrand Essential Hematology, Marshall's Chemical Pathology, and Levinson's Medical Microbiology and Immunology. How many times to read this books? Minimum 1 times for each books but 2 times cover to cover will not do any harm. Personally, I have read those 4 books twice and 1/3 times maybe. Because towards the exams, you will flipped those topics that you think you don't remember and you did not realised that you are basically reading it again because you basically don't remember everything. So settle with the books, then MCQ. Practice MCQ.. Initially I wonder if doing MCQ will bring any benefit, plus my friend said that MCQ question usually will not be repeated. Turns out that she was right but also wrong at the same time. This is because, past year MCQ will not be repeated but, past year end of posting or intensive course mcq, or mock exam MCQ will eventually came out in the real exam. It did! To think about it, those end of posting, mock and whatever that did not get vetted in the previous year, have 50/50 chances to be vetted in the current year. So MCQ is really important. OSPE questions... this usually will be recycled and if it did not, it will ask those thing that you learn in practical session in the lab. So now, I understand why our lecturer always told us to go to the lab and learn as much as we can from lab technicians regarding all these lab methods. Read enough histo slides, read enough hematology slides, read microbiology atlas, and practice chem path past year OSPE questions. If you are from Pathology background, this practical will be much easier for you. For me, I did not focus enough on reading hematology slides just because I have read more than 200 slides when I attached in hematology lab before entering Master exams. But I am really weak in Histology slides. I struggle a bit on that. Essay question will be your saviour. We already do the math. Essay is like a life support, or life jacket. This is where you can actually try to fried and cooked whatever you like to get marks. People said that you need to practice writing essays since the beginning of your first day in the program. I did not, now I know why. Because practicing essays does not mean you are remembering the fact of the answer, but actually to try and practice on time management. I have difficulties in managing my time during part 1 exams, 30 minutes is actually not that much time. Practice time management on essays is quintessential. That's all actually. Nothing much. I was lucky to pass the exams. I may not get the highest scores but who cares. The important thing is to pass the exams. If the passing mark is 50 then 50 mark is enough to proceed to Part 2. 100 mark, 70 mark, 80 mark, all will proceed to part 2 with those who get only 50 mark. 2. Cover to cover all 4 textbooks at least once but twice will do no harm. 4. Go to the lab to practice OSPE. ... and luck. I do not know how to get this, but if you have a way of increasing your luck, do it. If you know how to organised yourself, it will be an advantage. I don't. this is my study desk before the exams. A little bit of everything everywhere. P/S: I would like to give late congratulations to all my colleague who passed the exams. And to those who I loved to bother at an awkward time asking about something I do not understand, I would like to apologise for that and thank you very much for answering me, because without them giving me answer, I don't think I can passed the exams.